Blarion Mercurial and his sidekick Figment are back. After saving London and seemingly disappearing, we catch up with our heroes moments after the shocking ending of Figment. Can the newly minted Dreamfinder show others the power of imagination, or will rules and doubt crush our heroes' spirits? As our story opens we are introduced to a young dreamer today who's ambitions are checked by rules. She hopes to become a student at the Academy Scientifica-Lucidus USA, but it seems this dream is not to be. Meanwhile, Dreamfinder emerges in our day in front of a familiar building. This structure houses the new Academy Scientifica-Lucidus which has moved from London to the United States. 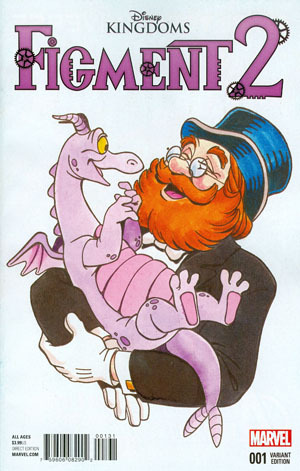 Figment and Dreamfinder explore, discover what some believed occurred to them after saving London and meet the staff. Some of the staff are very familiar while others just have familiar attitudes. The Academy is attempting to harness a new type of energy to power their many endeavors, and save the school, but Dreamfinder in his fancy Dream Machine offers another potential energy source...imagination! Can Dreamfinder deliver and have old opinions changed about the power of imagination? Jim Zub returns to write Figment 2 and it is clear that he enjoys the characters and theme of imagination. If anything my biggest concern with the writing is a replay of Figment as the Directors in both books seem to share very similar opinions about imagination. The time has just changed. The art duties are taken over by Ramon Bachs, who's models are slightly different than the first story arc. But honestly, it feels like the character models have been updated for a story taking place now instead of in the past. So the art change feels really appropriate. There are a number of Disney Easter Eggs, ranging from architecture to the Dream Machine to a mention of Medford. They grab the Disney fan and challenge you to pay attention for whatever could pop up next. Additionally, the story which appears to be about the power of imagination definitely has a Disney feel. I did read this story aloud to the Between Tween and Between Kid. They loved the story and the return of familiar characters. And I think they would enjoy seeing Figment return on a regular basis. 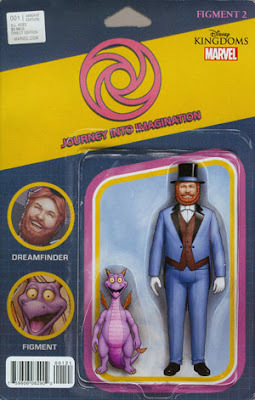 Maybe this would be a good opportunity for a reoccurring limited series under the Disney Kingdoms label, helping to keep Dreamfinder and Figment fresh as kids and Disney fans crave their return. 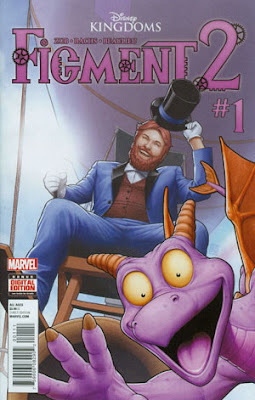 Jim Zub brings us back to the story of Blarion (Dreamfinder) and Figment in Figment 2 #1 "Part One: Living Legends". And the duo delivers as they evangelize the power of Imagination. I am hopeful that this second series will be as well written and as praised as the first. At the moment, I have no doubts!